Firefighters at the scene of an Alden Street home were a smoky kitchen fire was extinguished. 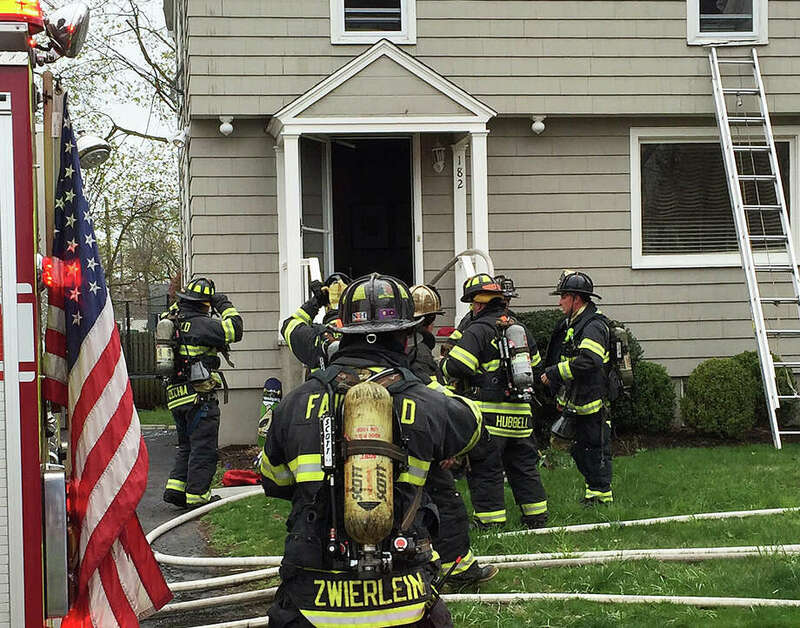 FAIRFIELD — A smoky kitchen fire that erupted Tuesday evening in an Alden Street house — where firefighters said the smoke detectors were not working — was quickly extinguished before spreading to the rest of the home. Firefighters were dispatched about 5:30 p.m. Tuesday when a neighbor called 9-1-1 to report plumes of black smoke were coming from the front door of the two-story house. Four engines, a ladder truck, a rescue vehicle and the shift commander were dispatched to the scene, where smoke was beginning to escape from the eaves above the second floor, according to the fire report. While one group of firefighters searched the dwelling to make sure all the residents had left safely, others doused the fire in the kitchen, which apparently started in the dishwasher, the report states. The first recall of units from the scene was issued about 5:45 p.m. by Assistant Fire Chief George Gomola, the incident commander. Personnel from the Fire Marshal’s Office and Building Department were called to the scene to investigate the cause of the fire and the safety of the structure. “Our firefighters, led by Lt. Brian McHugh, did an excellent job of quickly extinguishing this fire and preventing fire extension to the second floor and the attic,” Gomola said in a statement issued after the fire.